Beat the egg whites until soft peaks are formed and it doubles in volume. Break in the eggs, one by one, and beat well. Add the apple sauce, apple juice, oil and water and blend the mix well so that everything is well incorporated. In a bowl, sift together the whole wheat flour, baking powder, baking soda, salt, ground cinnamon and grated nutmeg. Add the dry ingredients to the wet eggâapple mix and blend well. Stir in the grated carrots, add the raisins, and mix well. Grease two 9-inch baking pans and pour the batter in the two pans equally. Smooth the tops. Bake in the oven at 350F for about 25-30 minutes and then again at 325F for about 10-12 minutes. Remove and cool on a wire rack before serving or applying frosting. Beat the splenda in a mixer to get a fine sugar mix. Add the cream cheese and butter to the mix and beat well to get a smooth mix. Let the mix stand for some time before using. Place one cake on a serving stand and apply a layer of frosting on the top. Put another cake on top of it and press lightly. Cover the cakes using the rest of the frosting from all sides. Cool the cake in the fridge for some time to let the frosting set before cutting up to serve. 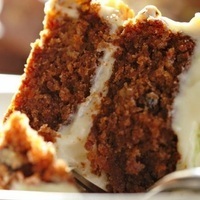 Note: Use freshly grated carrots as the juices will keep the cake moist. I like carrot cake, and I'm diabetic, will try this and let you know. Wow! the comments are tough. Maybe change the name to healthier Carrot Cake.. but I agree Splenda is not something I would feed my family, nor canola oil. But I think that each person could make some adaptions that they feel comfortable with and think are healthy. It's a good basic recipe and looks delicious. Thanks for sharing it. This sounds good to make. I haven't really tried to bake a carrot cake. This would be nice to follow.